Avgolemono is from Greek which translates to "egg-lemon". This combination is usually added before serving to give a creamy look to the soup or to thicken a cooking juice. The first time using orzo was a disaster, I added dried orzo with the broth and the rest of the ingredients, it ended to absorb most of the broth. 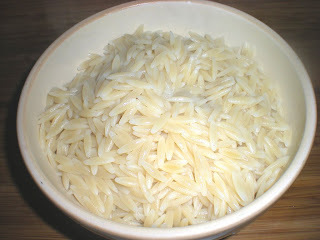 This time, I cooked first the orzo with water and then added at the end to the soup, I was very satisfied. 1. Cook orzo as directed in a large pot in boiling salted water until al dente. Drain and set aside. 2. In a soup pot, heat oil over medium-high heat. Cook chicken for 5 mins until all white. Season with salt and pepper. Set aside. 3. 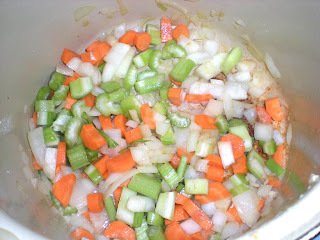 In the same pot, add all the vegetables and cook until tender. 4. 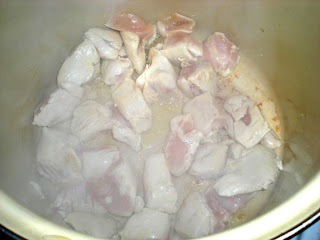 Add the chicken broth, bring it to a boil and simmer for 10 mins. Add oregano and season with salt and pepper. Add cooked orzo and cooked chicken. 5. Meanwhile, whisk eggs in a small bowl until frothy. Whisk in the lemon juice. 6. 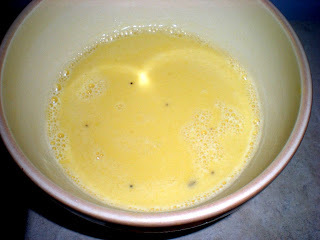 Temper egg mix with a ladle of warm chicken broth, whisking constantly to avoid egg from cooking. 7. 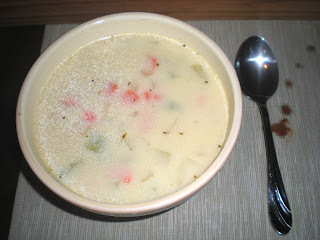 Take pot off the heat and add avgolemono sauce to soup pot, stir well until soup thickened. I love orzo. This looks like a warm and comforting soup for these fall days! Looks really interesting! I know adding eggs in the end will thicken the soup, but I'm very intrigued by the lemon?! this looks very interesting--I will be trying this! this is one of my fav all time soups! This is a classic here in Greece. The locals reserve a cup or two of the broth (cooled a bit) to whisk into the egg and lemon sauce before adding back into the sauce. An old Greek lady told me that her ratio is juice of one lemon to one egg. I eat this all winter.